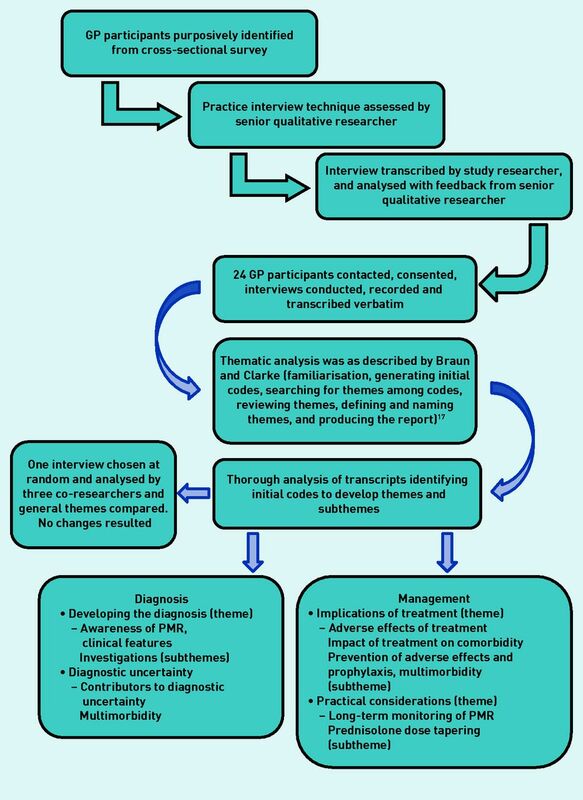 Summary of the qualitative telephone interview study. PMR = polymyalgia rheumatica. 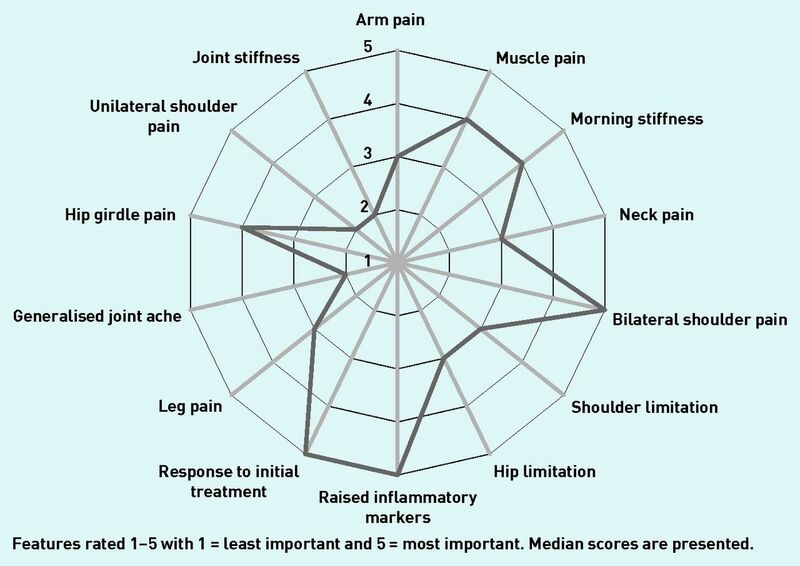 Radar plot depicting median scores relating to GP rating of importance of presenting clinical features used to diagnose polymyalgia rheumatica. 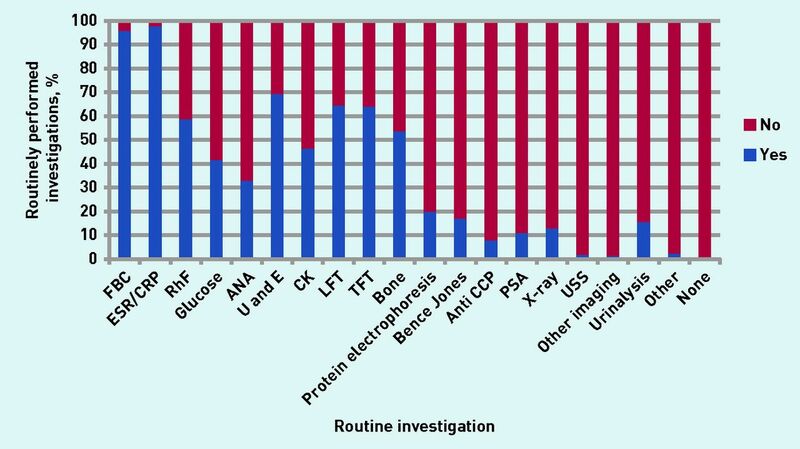 GP-reported routinely performed investigations for patients with suspected PMR. ANA = anti-nuclear antibodies. Anti CCP = anti-citrullinated protein antibody. CK = creatinine kinase. CRP = C-reactive protein. ESR = erythrocyte sedimentation rate. FBC = full blood count. LFT = liver function test. PSA = prostate-specific antigen. RhF = rheumatoid factor. TFT = thyroid function test. U and E = urea and electrolytes. USS = ultrasound scan. ↵a There were 8 duplicates online and 1 postal. IQR = interquartile range. SD = standard deviation. ↵a Identifiers in brackets after the quotes: GP followed by numeral = GPs who took part in the qualitative interview and their identifying number. Number of years = years as qualified GP. Participants followed by numeral = GPs who provided quotes from the survey. F = female. M = male. P = partner. S = salaried. CRP = C-reactive protein. ESR = erythrocyte sedimentation rate. HbA1C = glycosylated haemoglobin. PMR = polymyalgia rheumatica. ↵a Identifiers in brackets after the quotes: GP followed by numeral = GPs who took part in the qualitative interview and their identifying number. Number of years = years as qualified GP. Participants followed by numeral = GPs who provided quotes from the survey. F = female. M = male. P = partner. S = salaried. PMR = polymyalgia rheumatica.